Two new student trustees were officially seated this week on the Grossmont-Cuyamaca Community College District Governing Board. The student trustees, who are elected by their peers as non-voting board members, are Grossmont College student Peg Marcus, 62, and Cuyamaca College student Elsa Michelle Hernandez, 19. Marcus and Hernandez took their oaths of office for their one-year terms at the start of Tuesday night’s board meeting at Grossmont College. They join the board at a time of rebuilding as the colleges begin to add classes, staffing and other resources lost to the budget ax in recent years, along with a renewed focus on student success to help students reach their educational goals. Marcus said during Tuesday’s board meeting that she and Hernandez have talked about working jointly on community projects as student trustees to promote a message of unity between the two colleges and to reflect the district’s commitment to serving East County. ﻿What is the return on investment for an associate degree or a certificate of completion from one of California’s community colleges? The public can learn the answer to that question for 179 different programs offered at any of California’s 112 community colleges by visiting a new website, http://salarysurfer.cccco.edu/SalarySurfer.aspx and scrolling to the program in question. State Community Colleges Chancellor Brice W. Harris unveiled the new program at a news conference held at Grossmont College on Wednesday, June 19. The site looks at median incomes for students two years before they entered the programs, and two years and five years after they complete the programs, Harris told a news conference in the state-of-the-art Health and Sciences Complex at Grossmont College. Does it pay to study in high school? The 36 graduating students of Grossmont Middle College High School think so. To help pay for their upcoming first year attending college, they have aggregated a total of $287,000 in scholarships, grants and work study awards. That's an average of $7,972.22 per student with which to start the Fall 2013 college semester. In winning these awards, the students compiled a class average grade point average of 3.73 -- with 4.0 being a perfect A and 3.5 qualifying for honors. By no means did the students spend all their times at home or in the library studying. According to their counselor, Sharon Neumann, in their two years at Grossmont Middle College High School, they completed over 10,000 hours of internship hours at jobs in a wide variety of fields. 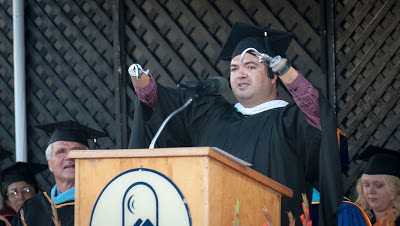 With those simple words, Grossmont College commencement speaker and now graduate Derrick Torrence paid tribute at Wednesday’s graduation ceremony to a son -- also once a Grossmont student -- fatally injured in a motorcycle accident in 2007. In a voice catching with emotion, Torrence said he often wondered if he might be in a classroom chair once occupied by his son, or if Andrew was equally baffled by math problems. “So this education is not mine alone as much as it is a continuation of Andrew’s college dream, as well,” said Torrence, who was joined at commencement by his daughter and fellow graduating senior Jacquelyn “Jade” Torrence. Number 1: Stay Connected. Just as I need my cables and straps to stay connected, do the same with your values. When times get tough – and they will get tough – stay connected to your ideals, your beliefs, your convictions. Stay connected to YOUR reasons for pursuing an education. Stay connected to the people that love you, and the dreams you possess. Number 2: CHERISH your education. Not just your degree, or what that degree may provide, but your EDUCATION. Where’d you go? What’d you learn? Who have you BECOME? In my life, being a triple amputee meant I had a harder road than most. I moved from my native Colombia to the United States when I was 4. I saw that my pathway to success would be education. A good education provides opportunity; and equality; and allows you to see promise, where the world sees challenges. After raising her children, E. Beth Smith decided to return to college, thinking a degree might lead to a career as a junior high school teacher. But that's not the way things turned out. She became a professor at Grossmont College, and today, as the incoming president of the statewide Academic Senate of the 112 community colleges in California, she will represent 50,000 college faculty members, who teach approximately 2.5 million students. Numbers like that might daunt anyone, but luckily for Smith she is a mathematician. She is on paid leave from Grossmont College as she helps her colleagues initiate or respond to legislation and policy dealing with the community colleges. Supportive of her efforts, Grossmont College pays her full salary, even though her constant duties in Sacramento preclude teaching in the classroom. Out of a separate budget, the statewide Academic Senate reimburses Grossmont College the cost of part-time instructors to teach Smith's mathematics courses. Sue Gonda, who currently serves as president of the Academic Senate at Grossmont College, noted that Smith was one of her predecessors in that position, and always was regarded as a "student-oriented faculty member." During debates over various educational issues, Smith typically would raise the question "just how will this proposal affect our students?" Gonda recalled. As a math instructor, Smith "found ways to give students credit for tutoring in high schools and grade schools, and was one of the earliest leaders on this campus for getting students to learn more about their courses by doing service work in the community." As Grossmont's Academic Senate president from 2003 to 2007, Smith said she advocated giving faculty members more opportunity to advise the Grossmont-Cuyamaca Community College District on what they thought should be budget priorities. Elected board members clearly have the right to make the decisions how to spend the public's money, she said, but before doing so they should have the benefit of hearing the faculty's input on the subject. Additionally, Smith said in an interview, a high point of her Grossmont College Academic Senate tenure was helping to initiate the debate over whether the college-- which then only gave "full letter grades" to students-- should adopt a system whereby faculty members more accurately could reflect the students' progress by giving them a letter grade with a plus or a minus. The decision to give such grades as a B+ or an A- was made by the Grossmont Academic Senate shortly after Smith completed her term. As president of Grossmont's Academic Senate, Smith started on her road to prominence in statewide academic affairs. She was subsequently elected as an area representative to the statewide faculty body, later as treasurer, and afterwards as vice president--her most recent position. Smith was fortunate in having as a mentor Hoke Simpson, a Grossmont College philosophy professor who served as president of the statewide Academic Senate from 2001 to 2003. This message was sent to employees of the Grossmont-Cuyamaca Community College District by Chancellor Cindy L. Miles. Our district’s mission statement is “Transforming lives through learning,” and I often hear moving stories about students who confirm that we are succeeding in our mission. As we celebrate more than 1,700 graduates at commencement ceremonies this week, I’d like to tell you about two special students whose lives were transformed because they came to our colleges. Long before Jamie started at Grossmont College, he was an angry, troubled boy – and many would say rightly so. Because his mother was an alcoholic and drug addict, Jamie was placed into foster care when he was four years old. He suffered physical and sexual abuse in his foster home, but never told social workers because he didn’t want to be removed from the only family he knew. His schooling deteriorated, and he often got into fights. School officials suggested he be placed in special education. Jamie’s situation worsened when he went to high school. His foster mother developed breast cancer, and his biological mother died. Jamie began experiencing anxiety attacks and had to be hospitalized. He barely made it out of high school. 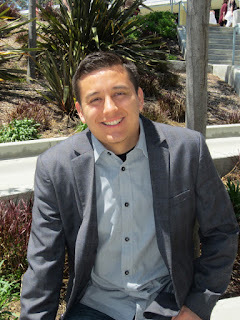 Then, on the recommendation of his older brother, Jamie attended the Summer Institute at Grossmont College. There he met caring counselors like Michael Perez and Pearl Lopez. They helped Jamie realize that education was his pathway to a better life. It’s summertime and the learning’s easy. The Grossmont-Cuyamaca Community College District’s Continuing Education and Workforce Training division, based at Cuyamaca College, has several new classes from June to August, with fees ranging from free to $95. Most classes are just $45. Vote for Cuyamaca College's Tree Frog Project! An innovative project to restore Cuyamaca College’s 47-acre nature preserve and educate high school students about the tree frogs that live there is eligible for a $25,000 prize – if enough people vote online for the project by June 20. The Foundation for Grossmont and Cuyamaca Colleges’ Tree Frog Project is one of eight selected as finalists for the 2013 Earth 8 Eco Ambassadors award, sponsored by KFMB Channel 8, San Diego Gas & Electric Co. and the San Diego River Park Foundation. Voting begins at 9 a.m. May 31, and the organization with the most votes by noon on June 20 wins the $25,000 grand prize. The second-place winner will receive $10,000, and all eight finalists will receive $2,000. To vote, go to http://cbs8.com/ecoambassadors and select the Tree Frog Project. One vote each day per IP address is allowed, so be sure to cast votes daily from your computer, phone and tablet. Go to www.facebook.com/Earth8SanDiego for additional details on the competition.